As we’ve learned at USGBC, quizzes are a popular way to engage customers. Since content can be placed into any kind of container—article, social post, podcast—marketers have license to get creative with the methods they use to share information. The interactive format invites people to take a moment out of their day to play a little, so a quiz is the ultimate clickbait. 1. Funnel people to the things they need. Using quizzes to promote your events lets you kill two birds with one stone: bring attention to registration and help attendees narrow their focus to which education sessions will help with their current challenges. We did this for one of our regional conferences with “What’s the right IMPACT session for you?” Asking potential attendees about their current job roles, pain points and goals, we generated session track recommendations for them with links to individual sessions. Similarly, to promote our professional courses, we published “What’s the right Education @USGBC course for you?” Filtering for job title, experience level, and current green building interests, we gave people customized recommendations for a particular education course. 2. Strike up a friendly conversation. 3. Allow customers to test their expertise. Structured around our LEED professional credentials, the “LEED Green Associate Playbook” and “LEED AP Playbook” marketing campaigns were among USGBC’s top-performing in 2017 and 2018. We knew that our customer base was deeply interested in content related to achieving these credentials, so we built an article series for each. 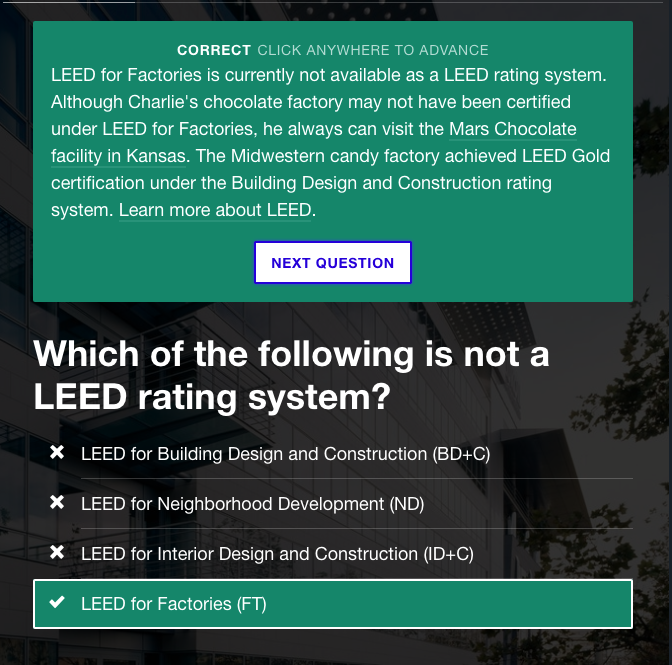 Sample questions from the credential exams went into “Are you ready to take your LEED Green Associate exam?” With more than 13,000 pageviews, the article is among our all-time best on usgbc.org. The quiz itself has been completed over 3,800 times. For our smaller, more expert LEED AP candidate pool, we posted “Are you ready for the BD+C exam?“, which has been completed almost 1,500 times. By offering real sample questions, we allowed readers to test their knowledge of the rigorous exam content, and we included customized responses for different levels of success. For those who didn’t do as well on the quiz questions, we linked to further exam prep resources. Keep it short, but put in the work. For the best quiz completion rate, ask about 5–10 questions. People are busy and won’t always finish a long quiz, so you have the best chance of engaging them with a brief series of questions. However, for the best user experience, you’ll need to make plenty of time on your end to come up with good questions and add useful responses and links for each answer. The more targeted and specific your responses, the more likely your quiz will result in conversions.